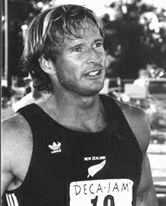 Simon lived with us every summer (NZ winter) and trained in the US for his shot at the Olympics. I would very much like to make contact with Simon. Could you forward his e-mail address to me or have him contact me at his earliest convenience. Maybe the el. timing just did not work on day2 of that decathlon, when according to the raw data, he put up 14,1s over the hurdles?